Dedicated meeting room space available to hire by the hour that makes you look good. You can meet clients and hold important discussions in a professional environment, and best of all as a &OFFICES client you get 20% discount. It goes without saying that you’ll need teas, coffees and chilled water in your meeting. Unlike many others we don’t see this as an ‘extra’ so it comes as standard at no additional charge on your room hire. You’ll also get a selection of quality biscuits to work through if you get peckish during your meeting. Want to kick off your meeting with bacon sandwiches? Maybe you want a working lunch to keep your meeting on time? Or maybe it would be nice to have an afternoon chocolate treat to pick up your delegates in the post-lunch lull? Whatever your catering requirement we offer a large range of hot and cold catering options to match that are delivered direct to your room on the time you specify. 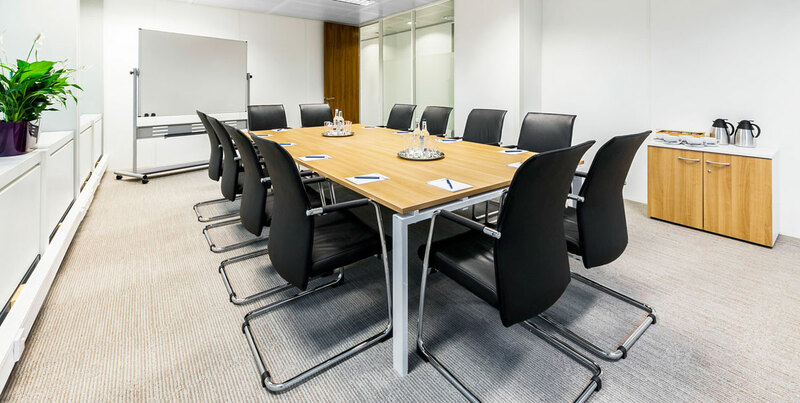 Most of our meetings are about people meeting people but there are occasions when you need to put on a big presentation or want to hold a national or international video conference and of course we can provide the facilities and equipment to make this happen. Simply let us know your needs and most of the time we have the products onsite but if we need to hire in specialist gear then that’s just what we do.